If you want increased energy, enhanced immunity, resistance and protection from stress, or recovery from overwork or illness, the Ultimate Invigorator is for you. Tonic herbs are some of the worlds finest herbal substances because the work in so many ways to help restore and rebuild health. They are what herbalist's and health conscious people the world over take daily because they know their restorative and health building properties. If you frequently feel tired and run down, or just feel like you want more energy, the Ultimate Invigorator can help. 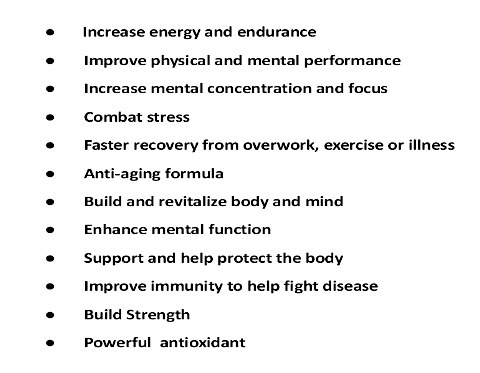 People use it to help them 'get through the day' with more energy and vitality. It also helps to strengthen and balance immunity. It is also an 'adaptogen' formula, so people who are under stress or extra pressure will find it helpful. It is a synergistic blend of 14 of the worlds finest tonic, adaptogen and support herbs traditionally used for centuries by athletes, kings, and layman alike to invigorate body and mind. That's why it is called the Ultimate Invigorator! Suggested Dosage: As a dietary supplement, take 1-2 capsules 2-3 times daily. Do not take at bedtime. Can be taken long term.